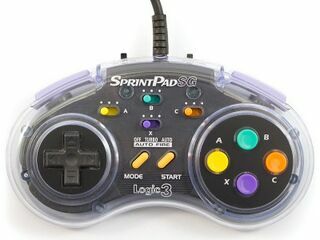 The Sprint Pad SG by Logic 3 is a third-party six-button controller for the Sega Mega Drive, complete with added turbo features. There is Sprint Pad 16 version, which have a combined Mega Drive/SNES plug. Some other controllers with similar shellcase were produced by Nyko, Nippon America and various unknown companies. It is essentially an enhanced Action Pad SG with more turbo options.